Eagle Air Medical Transport has had its first fatal accident. A Press Release with photos. 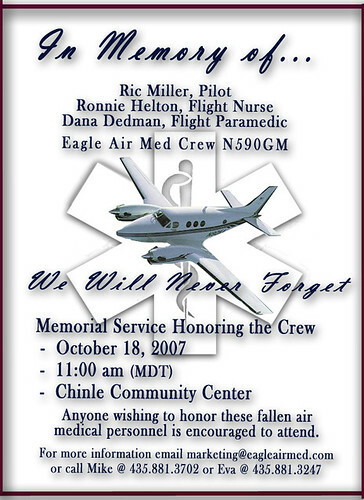 I was e-mailed a flyer for the memorial service (picture behind the cut), and spent the next twenty minutes frantically searching for pictures of the crew. I didn’t know any of them; they were part of the crew from Chinle, not from Kayenta. I was relieved that none of my friends died. And I felt horrible that their friends had.